An independent audit by a leading accounting firm conclusively demonstrates that Community Food Bank is an effective steward of its funds. 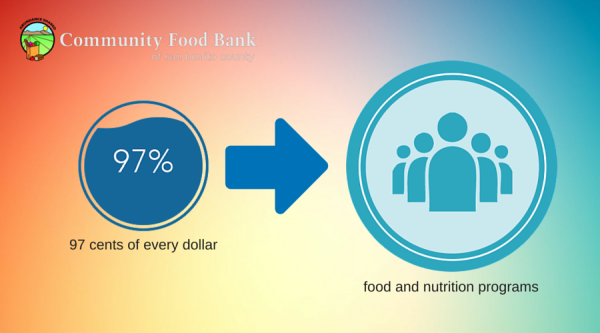 The audit, performed by the firm of Bianchi, Kasavan and Pope shows that 97 cents of every dollar received by Community Food Bank goes directly to its food and nutrition programs. That effectiveness is only possible through the generosity of a growing cadre of volunteers, according to Maria Lynn Thomas, chief executive officer for the food bank. Last year, nearly 17,000 volunteer hours were logged, with people doing everything from packing groceries to office support to helping customers at Pat’s Place, a local thrift store devoted exclusively to supporting Community Food Bank’s mission. Click here to read the audit in its entirety.